Word's readability score is a great place to start when you want to improve your writing. So let's take a look at what each score means and how you can use them to improve the readability of your work. Here’s some wonderful gobbledygook in a “research paper” (contempt-expressing scare quotes mine) on crisis management, which was recently published by a well-known management consultancy. Leverage analytics to drive prediction Use predictive analytics as a decision support tool to drive a forward-looking analysis of scenarios, response effectiveness, and critical correlations that can complicate or escalate events. Better understanding of the drivers of extreme events, whether external developments or internal process interactions, can help build a robust, flexible and dynamic crisis management program. The objective for enhanced analytics is not to predict events, but to help companies develop more meaningful warning indicators, and an increased awareness of their leverage in preventing or managing 'runaway' crises. And here’s a quick translation of what I think the writer is trying to say (do say in the comments if you think I’ve missed any crucial details). I think my version’s more readable. But don’t take my word for it - take a look at each readability score I got from running each piece through the readability tool in Word. When its finished the spell check, Word will give you a rundown of each readability score. Facts and figures are one thing, but how do you interpret each readability score? Let’s look at the two sets of scores above. Words As any writer will tell you, short and sweet is best, and as George Orwell advised, if it’s possible to cut a word out you should. 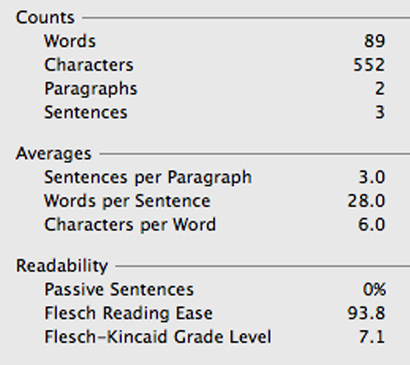 So at 56 words, my text beats the original's readability score (89 words) by some way. Paragraphs We were equal on these readability scores, but as a rule of thumb, you should aim for as many paragraphs as you can. Check your morning paper. Notice that most paragraphs are no more than one or two sentences long. That’s because short paragraphs are kinder on the eyes - and therefore easier to read. Sentences Again, we scored equally on this occasion. But, as with paragraphs, the higher this figure the better (within your word count). Because if you try to cram too many ideas into one sentence, your writing can become hard to follow. Remember: full stops are good. They make life easy for your reader. Words per Sentence A glance at the two readability scores shows that average sentence written by the original author is 28 words long, compared with my average of 17.3. I try to stick to a maximum of 24 words a sentence as that’s the point they get hard to read. Some writers are even stricter than me and aim for 20. Use any more than this and it could be a sign you’re trying to cram too many ideas into one sentence. Characters per Word This readability score tells me the average word in my text is 4.2 letters long, compared with six in the original. Like the great orator Winston Churchill, every writer will tell you that short words are best. Given the choice between the polysyllabic indicators and the monosyllabic signs, most writers will choose the latter - as I did. So aim for an average score here of no more than five. Passive Sentences We both scored a zero on this readability score, which is a good. In the main, you should be aiming to write in the active voice, not the passive voice, as active sentences are shorter and more dynamic. Flesch Reading Ease The Flesch Reading Ease and the following readability score, the Flesch-Kincaid Grade Level, take into account all the scores we’ve discussed so far to provide an overall idea of readability. Surprisingly, we both got pretty good scores here, though I got top marks with 100% readability compared with the original author’s 93.8%. That the original author achieved an impressive-sounding 93.8% tells you that readability tests are fallible. I suspect most human beings would not read that paragraph and declare it 93.8% readable! Flesch-Kincaid Grade Level This score tells you the number of years of education that are needed to understand your text - if you add five to the figure, you get the average reading age that’s required to read it. So what you’re looking for here is a low figure. I compare favourably with the original author - my text could, apparently, be understood by an eight year old. According to this measure, that same reader would have to reach the age of 12 before she could understand the original author’s text. Again, I think you’d be hard-pressed to find anyone of any age who would declare the first piece readable. I struggled to follow what the author was trying to say and I have a PhD in English literature - which amounts to a lot more than 7.1 years of education! What are the overall lessons here? 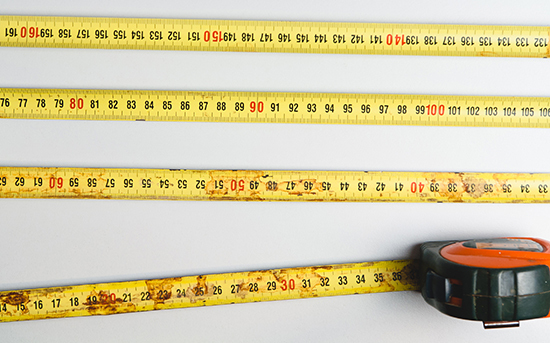 Readability statistics are a useful but blunt tool. Don’t assume a great score means you’re a great writer. But do use them as part of your editing process. They can help you compare your before and after versions, or can point you toward ways to improve. For example, if you get more than 0% on your Passive Sentences readability score, go back and see if you can switch any of those sentences around. Or if you’ve got more than two or three sentences per paragraph, try and put some white space in your text. You have a thing called a paragraph return key. Use it. And if your average word is more than five characters long, underline all the long words in your text and think of shorter alternatives. Finally, don’t underestimate the power of the readability tool as a weapon. If you struggle with verbose executives who think it’s smart to use words like critical correlations or internal process interactions, throw some statistics at them. I know of one writer who gave his CEO scientific proof that his version of a piece of text was better – simply by pointing out differences in the Flesch-Kincaid Reading Ease figure. The CEO accepted the writer’s edits without question. Next week, I’ll look at these texts again, when I’ll offer some further tips on how to make your writing more readable, backed up by some statistics of my own.